After years of outcry from voters, the State Legislature finally voted to make New York the 38th state in the nation to pass Early Voting, in addition to a whole host of other voting reforms. Activists from the Let New York Vote Coalition packed the hallways, rallying earlier in the day in front of the State Senate Elections Committee hearing to celebrate their victory and continue to push lawmakers to pass the most comprehensive, efficient and accessible voting rights reforms. "For years, New Yorkers have been demanding efficient, equitable and accessible elections and, finally, on the first full day of the legislative session both the Assembly and the new Senate Majority, responded with a robust package of voting reforms; making clear their commitment to democracy. The initial bills including, early voting, registration portability, consolidation of primaries, and pre-registration of 16 and 17 year olds, are a fantastic first step and we look forward to working with lawmakers and the Board of Elections to implement these long overdue reforms. 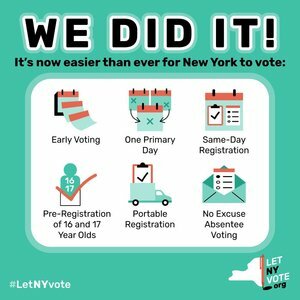 New York can and will be a shining example of democracy," said Susan Lerner, Executive Director of Common Cause/NY and a founding member of Let NY Vote. Early Voting: in place in 37 other states, allowing citizens to cast ballots in person days, sometimes weeks, before an election. Pre-registration of 16 and 17-year-olds: 13 states plus DC allow for pre-registration for voting at 16 and 17 years old. Pre-registration increases the likelihood of voter participation among young adults. Engaging potential voters at a young age and bringing them into the voting process early helps create lifelong voters. Consolidation of Primary Dates: Currently New York has two primary days in June and September, confusing voters. New York is the only state with two primaries. Vote by mail: No eligible voter should have to provide a reason to be able to vote absentee. Same day registration: 18 states and DC have Same Day Registration. Same Day Registration enables voters to register and vote at the same time and increases voter turnout. Universal transfer of voter registration: If a voter moves anywhere within New York State, their registration address will be automatically updated, and if not, he or she will be able to vote by affidavit ballot. "We welcome voting reforms that will make voting easier for everyone, including people with disabilities. Polling sites, voting equipment, methods of registration all need to be accessible in compliance with disability rights laws and election-related workers and volunteers need training to ensure that they are prepared to assist voters with disabilities," said Susan Dooha, executive director of Center for Independence of the Disabled, NY.